When you live on such an inclusive campus as SNU, it’s easy to slip into our little sleeves of comfortability. When I first got here I felt more alone than I ever had; that is until I met some people I am glad now to call friends. But that’s as far as it went. We know who we know and new faces become rare. But variety is the spice of life. New faces make new friends, and in turn those make new connections. I had the pleasure of making the acquaintance of SNU’s Assistant Director of Financial Assistance in the Professional and Graduate Studies Department. Just one of the many cheery faces you all may have had the pleasure of seeing at the Diversity Forums is Ms. Wakita Oliver, though she made it clear she would prefer to be called just Wakita. A 4-year-veteran employee of SNU, Wakita is also a full-time graduate student. She previously attended Southwestern Oklahoma State University and UCO. Oliver is an Oklahoma girl, born and raised. Much like some of our college students, she is a graduate of Del City High School, with such accolades as Senior Class President, Parliamentarian and a participant in Student Body Government, to name a few. She grew up in diversity, citing Del City as a well-varied pool of racial coexistence. Wakita also comes from a family that accepts and appreciates diversity in all forms. After high school Wakita went off to SWOSU in Weatherford, Oklahoma and studied nursing. While there, she decided that this would not be the field she would want to pursue a degree in and later transferred to UCO to study psychology. 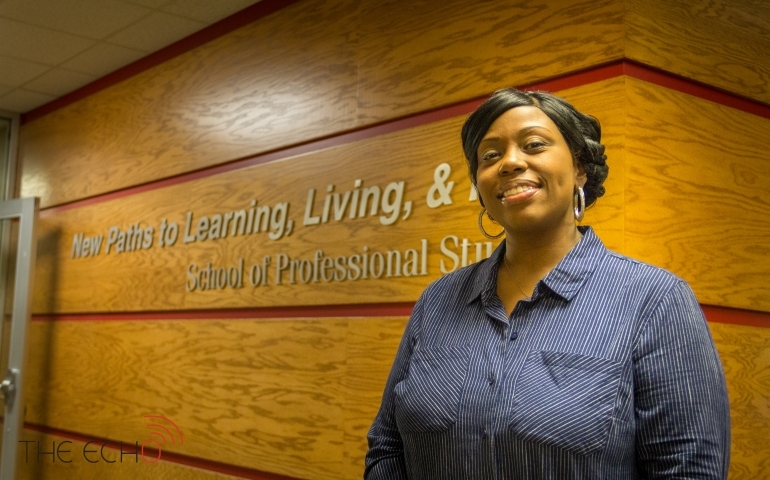 In 2012, Oliver joined SNU as a financial aid counselor and enrolled in the Adult Studies Program as a bridge student and later went into the degree completion program, family studies and gerontology, where she received her undergraduate degree in 2014. In 2013, Wakita was promoted to the Assistant Director of Financial Assistance for PGS. In PGS, students are brought in by admissions as they would on the traditional side. Rather than assisting traditional learners, PGS assists adult learners who are making the transition back into college later in life. Because Wakita is in Financial Aid, she will have the opportunity to get to know each and every one of these students from their start at SNU to graduation; this means through their high points and low points as well as through their entire SNU career. Wakita says her reward is definitely not monetary; her reward comes when she gets to see the women and men she has invested her life in walk across that stage with a smile on their faces. As Oliver puts it, “The payoff is to see them walk and obtain their degree. Some of these students are fulfilling a lifelong dream”. Currently, along with her rank in PGS, Wakita is a part the committee that sent out the petition to bring more diversity to the SNU campus. She understands there are skeptics of this movement out there, and would like to reassure them that the goal of this is to “use the diversity that we have to bring in more.” This act does not boil down to a racial hiring quota, but rather aims to bring in deserving and qualified African American professionals and other ethnicities who desire to work at SNU. As it is, our university has a less than stellar reputation in the African American community. Wakita is also a die-hard SNU employee and student. She is able to change lives here. This is her home, and as of May she will walk across the stage with her graduate degree. Wakita would like the campus to know she is here for you regardless of race, traditional student or adult learner; when others may turn against you, she said that “You have an advocate in me.” So please, when you have a free moment, go over to Royce Brown and get to know Wakita Oliver: staff, student and friend.